Dr. Sol Taylor: Collecting Lincoln Cent Varieties. Difficult to discern with the naked eye, the doubling of LIBERTY in this 1995 Lincoln cent is readily apparent under a magnifying glass, top. 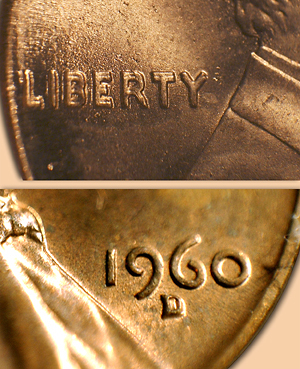 It often takes an expert, however, to distinguish repunched mint-mark (RPM) varieties, as in this relatively common 1960-D example, bottom. coin "variety" is a consistent variation caused by a defective die, or a die with more than one impression. An "error," on the other hand, is a mechanical malfunction such as a clipped planchet, double or triple strike, die break, or similar error. Collecting varieties is a major part of today's numismatics. Here are some of the more exciting and valuable Lincoln cent varieties. * * * The first major variety is the 1909-VDB doubled-die obverse. This was discovered around 1977. The doubling is seen in the "TY" of LIBERTY and the "19" of the date. Uncirculated specimens sell for well over $100. A more common type of variety is the repunched mint mark, also known as RPM. The first in the series is the 1909-S over horizontal "S." Since the mint marks were applied to the dies at the mint  "S" for San Francisco and "D" for Denver (no mint mark used for Philadelphia), there are numerous varieties where the mint mark was punched in more than once. These RPMs vary widely in value, and for some dates are worth only a few cents each  such as the many types of 1960-D RPMs and 1961-D RPMs. The much scarcer over-mint mark is where one mint mark, such as a D, is struck over an S. There are only a few verified examples of this; the first one discovered in the Lincoln series is the 1944-D/S. This over-mint mark, also known as OMM, is very scarce, and prices for this variety range in the hundreds of dollars for mint-condition specimens. The most popular of the varieties are the doubled dies. Perhaps the best known is the 1955 doubled-die obverse. While not rare at all, it is very dramatic, and although it was discovered at the mint in 1955, the production went through due to the demand for cents in August 1955. Most were released into circulation, and no hoards have ever been discovered. "Choice uncirculated" specimens have brought more than $10,000 in recent auctions, and at least one or two show up at every major coin auction in various grades. * * * Besides the 1909-VDB doubled die, the next verified doubled die occurred in 1917, but it was not discovered and publicized until the 1970s. The motto "In God We Trust" shows doubling in the "WE," and the date shows slight doubling. While much scarcer than the 1955/55, it sells for much less. In 1936, no fewer than five different doubled dies were made; they range from scarce to rare. In 1941, three different doubled dies were produced. The next best-known doubled die is the 1972 DDO (doubled die obverse). By the end of the year, eight additional DDOs were discovered for 1972, but the first one, known as "DDO 1-0-I" is the most valuable; mint specimens sell for up to $400. The others are less obvious and sell for much less; in one case, examples are fairly common and are worth about 50 cents. In 1983, a very unusual doubled die was released: The reverse was doubled, known as "DDR 1-R-I." Although fairly scarce, it is available in mint condition for less than $250. Many other doubled dies are known in the Lincoln cent series, and most are so minute as to require close examination with a powerful magnifier.